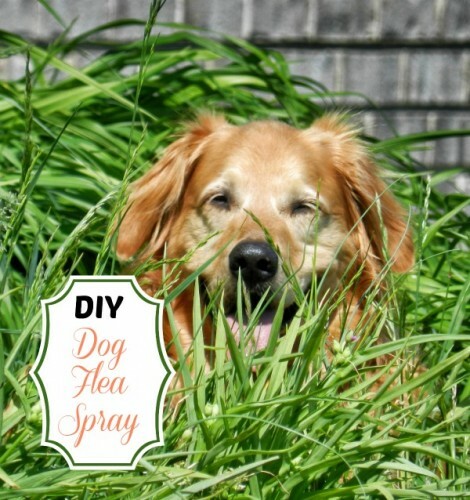 This DIY Dog Flea Spray is all natural and inexpensive. If your dog spends a lot of time outdoors like mine does, then fleas are bound to be a problem for you. Just sitting near grassy areas will bring the fleas to your best buddy. Just mix the ingredients together in a spray bottle, and apply the mixture directly to your dog’s coat.Work it in with your hands and rinse well, and your pooch is protected from those pesky fleas without the cost or the chemicals of store bought flea protection. The remedy will not last as long as chemical protection and must be reapplied fairly often to be effective. It can also be used on cats but they might resist, since they don’t like the smell of vinegar. Castile soap is also known as vegetable soap. It is made with olive oil and is very gentle. Vinegar seems to act as a natural flea repellent. I use it for combating ants in my kitchen with great success too. See more household tips on The Gardening Cook on Facebook. When you say ‘work it in with your hands and rinse well’, do you mean rinse it off the dog or rinse your hands?? Hi Rose. Rinse the dog and of course you would also rinse your hands after.